UBC launched the Blue & Gold Campaign for Students with the goal of raising $100 million over three years to support students. 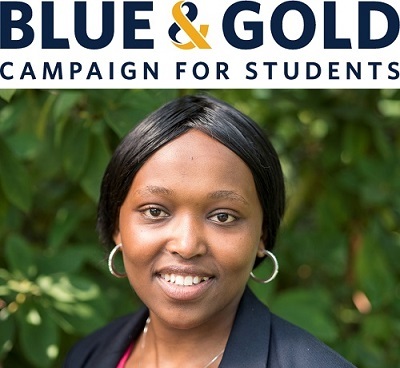 Those who give to the Blue & Gold Campaign provide promising students access to a life-changing education — and perhaps more importantly — invest in the future of our province and our global community. Born and raised in Kenya, Monicah Namu explains why she felt compelled to come to UBC for a Master of Food Science degree, a professional program within the Faculty of Land and Food Systems. Without donor support, she could not have made the journey to Canada. Namu was supported by the Mastercard Foundation Scholars Program, which gives students from Africa financial, social, and academic support to complete their education. After graduating, the scholars then use their learning and experiences to contribute to the economic growth and social transformation of their communities in Africa. “Words cannot explain my gratitude to the Mastercard Foundation for having a program that supports students from sub-Saharan Africa to study at global universities like UBC. I could not have done this without their support. In the Faculty of Land and Food Systems, students in the professional programs sometimes experience financial hardship due to program costs and demands, especially when unpaid work experience is a requirement of the program. The professional programs include Master of Food and Resource Economics, Master of Food Science, Master of Land and Water Systems, and Dietetics. These programs are training the leaders of tomorrow to find solutions to pressing problems in our global food system and in our natural resources. UBC students such as Monicah Namu are ready to create meaningful change and tackle the challenges that affect us all. Supporting these promising students today — so they are equipped to build a better tomorrow — is more urgent than ever. Please consider supporting the Blue & Gold Campaign for Students to change their world so they can change ours! Contact Alexa Class-Freeman, Development Officer, alexa.class.freeman@ubc.ca, to learn more. If you are an alumni interested in getting involved with our students, please get in touch. We want to hear your story. Contact Niki Glenning, Alumni Relations Manager, niki.glenning@ubc.ca.